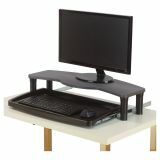 Features a monitor shelf adjusts 3" to 6-1/2" above desk surface. Extra-wide 26" tray with integrated mousing area holds all keyboards, even ergonomic. Full-length gel wrist rest and mouse pad included. Cable management for keyboard and mouse. 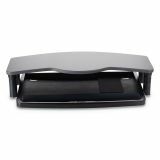 Kensington Comfort Desktop Keyboard Drawer With SmartFit, 26w x 13-1/2d, Black/Gray - Maximize workspace by raising your monitor (supports up to 80 lb.) and storing your keyboard and mouse underneath. Monitor shelf adjusts 3 to 6" above the desk surface to provide the most comfortable viewing position using your unique SmartFit comfort color. 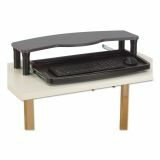 Extra-wide tray (26") with mousing area fits all keyboard sizes including oversized and natural-shaped styles. Full-length wrist rest and mouse pad are included." Supports up to 80 lbs. or 21" monitor.